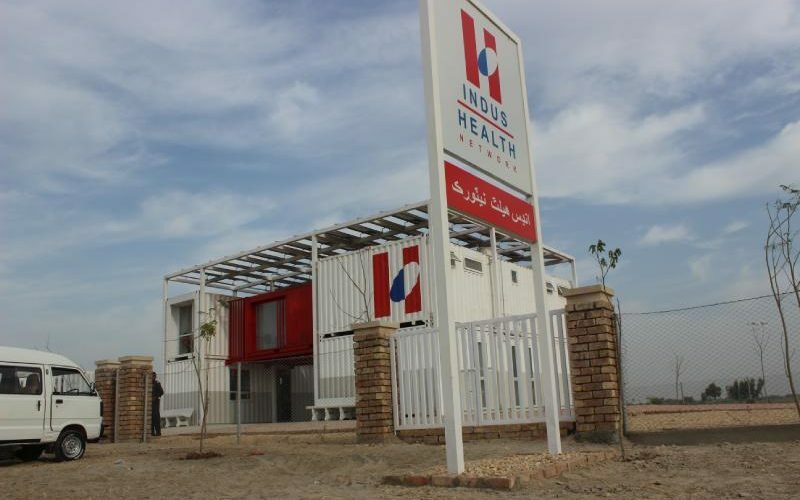 Khorwah Chowk, Primary Care Center, Badin, 5th April 2019: The Primary Care Program – led by the Global Health Directorate, under the Indus Health Network – launched its first prefabricated container facility in Pakistan at Khorwah Chowk, Badin. This clinic can treat upto 200 patients per day, and in conjunction with a community engagement centre is estimated to impact 150,000 patients per year. This container based clinic includes a variety of free of cost, services ranging from routine medical checkups by a family physician, mental health counseling, lab collection, access to medicines, x-ray facilities and an integration with public health programs. The Primary Care Program aims to enhance access to free of cost, quality health care and associated services to patients. It serves to function as the first point of contact to provide continuous, comprehensive and coordinated care to patients. Prior to the deployment of the container clinic, patients had to travel approximately 3 hours or more to Badin for their treatment. This clinic will be the first of its kind, catering to a catchment population of 2.8 million who lack access to basic healthcare, and will bring health care closer to where people live and work. Services in each facility are customized based on an assessment of the surrounding community to match the healthcare needs of the population in order to improve health indicators. Khorwah Chowk, Primary Care Center is centrally located on the main National Highway with easy access to surrounding districts of Badin, Mirpur Bathoro, Sujawal, and Jhok Sharif. This setup will be part of a network with Civil Hospital Badin to cater to pediatric to geriatric patients. Patients requiring specialized care will be referred to Civil Hospital Badin. The Primary Care program has 12 districts of interest in lower Sindh and lower Punjab, with Badin being of key interest in Sindh. The program will set up 15 additional facilities , including a mobile bus in the district of Badin by 2020. Each of these facilities will have trained family medicine physicians and integrated public health programs based on the needs of the community. The community engagement team at each facility connects community needs with primary care and public health programs to promote sustainable access and utilisation of healthcare services. In addition, staff at the facility will be trained in acute care management to ensure that all patients visiting our facilities are stabilized and given the highest quality care.